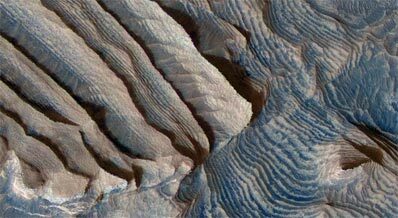 PASADENA, Calif. -- Climate cycles persisting for millions of years on ancient Mars left a record of rhythmic patterns in thick stacks of sedimentary rock layers, revealed in three-dimensional detail by a telescopic camera on NASA's Mars Reconnaissance Orbiter. Researchers using the High Resolution Imaging Science Experiment camera report the first measurement of a periodic signal in the rocks of Mars. This pushes climate-cycle fingerprints much earlier in Mars' history than more recent rhythms seen in Martian ice layers. It also may rekindle debates about some patterns of rock layering on Earth. Layers of similar thickness repeat dozens to hundreds of times in rocks exposed inside four craters in the Arabia Terra region of Mars. In one of the craters, Becquerel, bundles of a 10-layer pattern repeat at least 10 times, which could correspond to a known 10-to-one pattern of changes in the tilt of the planet's rotation axis. "Each layer has weathered into a stair step in the topography where material that's more resistant to erosion lies on top of material that's less resistant to erosion," said Kevin Lewis of the California Institute of Technology, Pasadena, who is the lead author of a report on the periodic layering published in the Dec. 5 edition of the journal Science. Some periodic change in the environment appears to have affected how resistant the rock-forming sediments became, perhaps from changes in what size of sand or silt particles were deposited by the wind, or from how the particles were cemented together after deposition. Some of the individual layers are less than three feet thick. 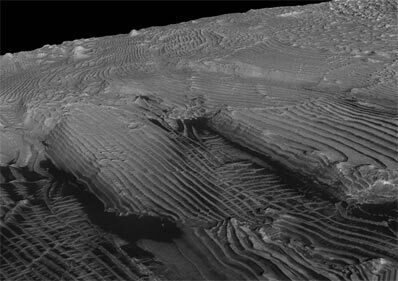 The camera, called HiRISE for short, took pairs of images of each site from slightly different angles in orbit, providing the stereo information necessary for determining each layer's thickness. "It's easy to be fooled without knowing the topography and measuring the layers in three dimensions," said Alfred McEwen of the University of Arizona, Tucson, principal investigator for the camera and a co-author of the new report. "With the stereo information, it is clear there's a repeating pattern to these layers." Geologists commonly find "rhythms," or repeating patterns, in sedimentary layers on Earth. Determining the source of the rhythms can be difficult. Some result from annual or tidal cycles, or from episodic flooding that may not be periodic at all, but the role of longer-term astronomical cycles has been debated. One step in showing that astronomical cycles can leave their mark in sediments came from finding repeating five-layer sets in some terrestrial bedrock, matching a known five-to-one ratio of two cyclical variations in Earth's orbit. Lewis and colleagues found something similar on Mars: "Our findings suggest that cycles of climate change led to the patterns we see recorded in the Mars rock layers today, possibly as a result of similar variations in Mars' orbit," he said. "Mars has a 10-to-one ratio in cycles of how its tilt changes -- smaller wobbles within larger packages. Sure enough, we see a 10-to-one ratio in one of these layered deposits. It's like trying to identify a song -- it's easier if there are multiple instruments playing different parts, rather than just a single rhythm." In addition to having rhythm of 10 beats to the bar instead of Earth's five-beat pattern, Mars has characteristics that make it a good laboratory for studying how astronomical cycles affect climate. The tilt of Mars' axis varies much more than the axis of Earth, because Earth's relatively large moon provides a stabilizing effect. And, at least for most of its history, Mars has lacked the oceans and thick atmosphere that, on Earth, modulate the effects of orbital variations and add their own cyclical patterns. The 10-beat pattern of Mars' wobble lasts about 1.2 million years. If the 10-layer bundles in Becquerel crater are indeed signatures of that cycle, the 10 or more bundles stacked on each other record about 12 million years when environmental conditions affecting sedimentation were generally steady except for effects of the changing tilt. NASA's Jet Propulsion Laboratory, a division of Caltech, manages the Mars Reconnaissance Orbiter for NASA's Science Mission Directorate, Washington.�Lockheed Martin Space Systems, Denver, is the prime contractor for the project and built the spacecraft.�The HiRISE camera was built by Ball Aerospace and Technologies Corp., Boulder, and is operated by the University of Arizona.